If you’re on Pinterest, you may have seen a certain recipe of mine floating around there. 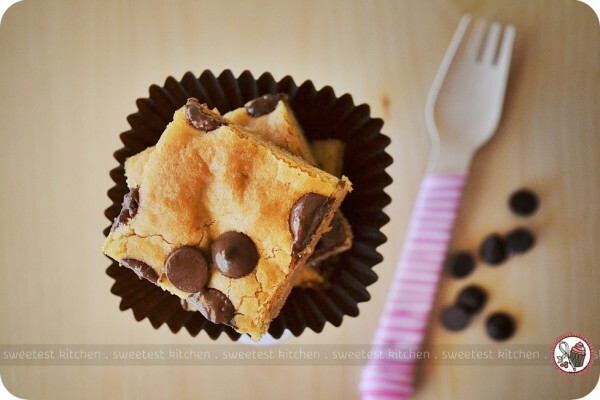 These peanut butter chocolate chip blondies I made a year ago have went “viral” on Pinterest. It only happened recently; previously these homemade chocolate peanut butter cups were the most popular recipe on my blog, with visitors coming mostly from Pinterest or FoodGawker. I’m not even sure how they were so popular as I think the pictures for those chocolate peanut butter cups are just terrible! 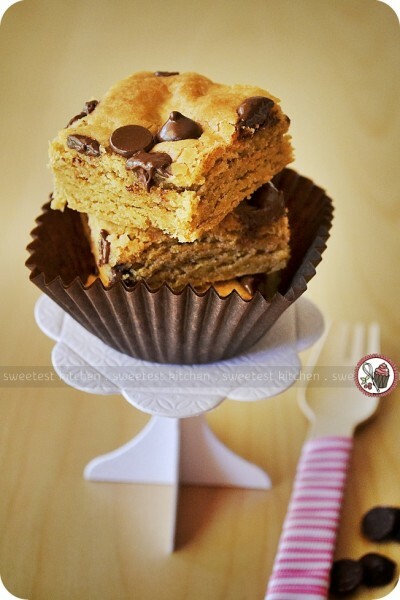 Well, as the blondies have been earning my blog thousands of visits from Pinterest each week, I decided to do a recipe-flashback post by baking the blondies again and, hopefully, taking better photos. I have to be honest and say that this isn’t particularly one of my favorite recipes; it seems that I raved about this recipe in the original post, but it just didn’t do the same for me the second time around. It was just “okay”. It’s quick and easy and it’s one of those recipes where you probably already have everything to make it in your pantry. 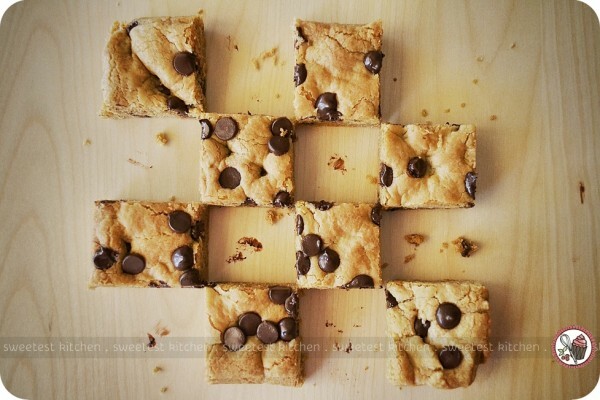 The blondies, when finished, taste great, but only fresh from the oven, in my opinion. Once they cool, they start to become too firm and stale rather quickly. You must make sure they’re eaten before the end of the day after baking, I’d recommend. This is something I also pointed out in my first post about these blondies. It’s not the sort of recipe that will absolutely “wow” you, but they do have a gorgeous, brownie-like flaky top. And those gooey chocolate chips? You simply cannot beat that. 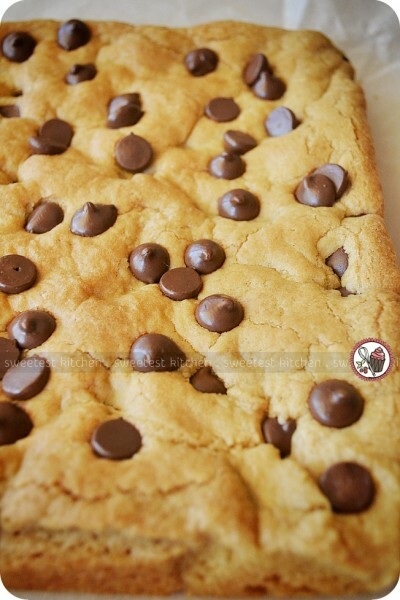 Another “must” for this recipe – you must not overbake the blondies. In doing so, you would lose that overall gooey-ness that you’ve come to expect from a blondie. The same goes for brownies as well. No overbaking! I’m not sure if these photos are any better than my originals, with the red and white stripey plate, but I had a lot of fun baking this recipe again and taking the photos. And I’ll admit, I actually messed up the recipe by adding double the amount of butter! I have no idea how I managed that, but luckily I had enough ingredients to start over. You wouldn’t believe how greasy-looking the batter looked! I had actually prepared the entire recipe and was trying to spread the batter out in the pan when I noticed something was really wrong. It was so greasy and wouldn’t spread out properly. I’m just glad I noticed it before I placed it in the oven! Anyway, if you’re craving peanut butter and chocolate, or just simply something sweet, by all means, give this recipe a go. Just don’t expect it to knock your socks off just because it’s been “viral” on Pinterest! 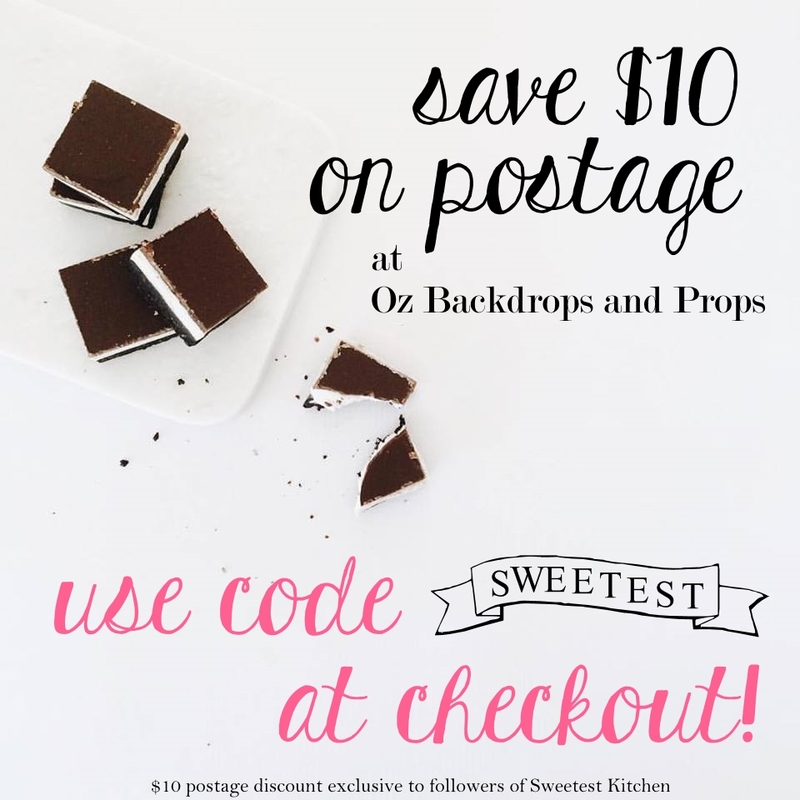 If you decide to bake a batch, let me know what you think! Note that I have halved the original recipe to fit in an 8×8-inch square pan. Revisiting one of the most popular posts on my blog to remind myself what all the fuss is about! Preheat the oven to 350°F. Grease an 8×8″ square pan and set aside. In a saucepan over medium heat, melt the butter and brown sugar, stirring constantly until smooth. Remove from the heat, and stir in the peanut butter. Allow to cool. Previous Post: « Happy Halloween! Yum! These look delicious Jamie! I love making old recipes – I have a folder of tried and tested recipes at home that I go straight to when entertaining. The biggest hit by far is my apple crumble cake – made with whatever fruit we have around! Looks delicious! Could you please specify what you mean by “half stick of butter”? Is this 1/2 cup? Or 1/4 cup? Hi Fatima, I apologize for the confusion. By “1/2 stick of butter”, I mean 1/4 cup. Wow this was too confusing. Idoubled it and I packed the brown sugar as it didn’t specify. And all cookie recipies tell u to..then stirred it til my arm ached at least for 35 mins. Sugar never ‘melted’ and it was still like brown sugar playdough. I’m sure this is why it turns crumbly for everyone. waste of time and money. Sure looks and sounds easier than it is. Hi Brenda, I’m sorry you had trouble with these. Basically, in baking, brown sugar should *always* be packed, unless specified. If it doesn’t specify, definitely pack it! I have no idea why your butter/sugar mixture didn’t become smooth. The batter is not pourable or runny, however; it is more similar in consistency to cookie dough and needs to be pushed and flattened into the pan.